Dubai: Emaar Properties weighed on investor sentiments for the most part of Thursday on the Dubai index, until the final hour of trade, when the gauge saw a sharp recovery. The Dubai Financial Market general index closed 0.10 per cent lower at 2,514.36, recovering from a low of 2,501.20. The developer closed 0.48 per cent lower at Dh4.11, after hitting a low of Dh3.85. Its other unit, Emaar Development, closed 1.32 per cent lower at Dh3.75, while Emaar Malls was steady at Dh1.57. “Investors have not shied away from displaying their concerns as selling resumes on Emaar Malls, Emaar’s retail arm, which despite superior results and multiple calls to “buy” maintains a downtrend,” Issam Kassabieh, Senior Financial Analyst at Menacorp said. Emaar Properties has been one of the worst performing stocks with shares losing nearly 40 per cent of its value. Among other stocks, Dubai Islamic Bank closed 0.39 per cent higher at Dh5.14, while DP World closed more than 2 per cent lower at $16.09. Aramex was nearly 1 per cent lower at Dh4.05. Banks again came to the rescue on the Abu Dhabi index, which closed 0.97 per cent higher at 5,019.16. First Abu Dhabi Bank (FAB), Abu Dhabi Commercial Bank and Union National Bank surged resulting in solid gains. FAB closed 1.24 per cent higher at Dh14.70, while ADCB was 5.29 per cent higher at Dh9.15. UNB finished the week 2 per cent higher at Dh5.11. Etisalat was at Dh16.88, unchanged from the previous session. The Dubai index has been languishing due to weakness in the property and banking stocks weighed down by concerns over slowdown in growth. The index has shed 7 per cent in the year so far, building up further on losses of nearly a fourth since the past one year. “The indices headings are unclear at the moment; however maintaining somewhat decent volumes could prove more important in order to activate speculation and trading activity,” Kassabieh said. Elsewhere in the region, the Tadawul index was 0.37 per cent lower at 8,434.89. The Nomu index closed 4 per cent higher at 2,891.20. The energy index was down 1.2 per cent at 4,855.61. Saudi Basic Industries closed at 120.40 riyals, down 1.95 per cent. Alinma Bank was 0.25 per cent lower at 24.04 riyals. Dar Alarkan Real Estate Development Co. closed 0.42 per cent lower at 9.45 riyals. 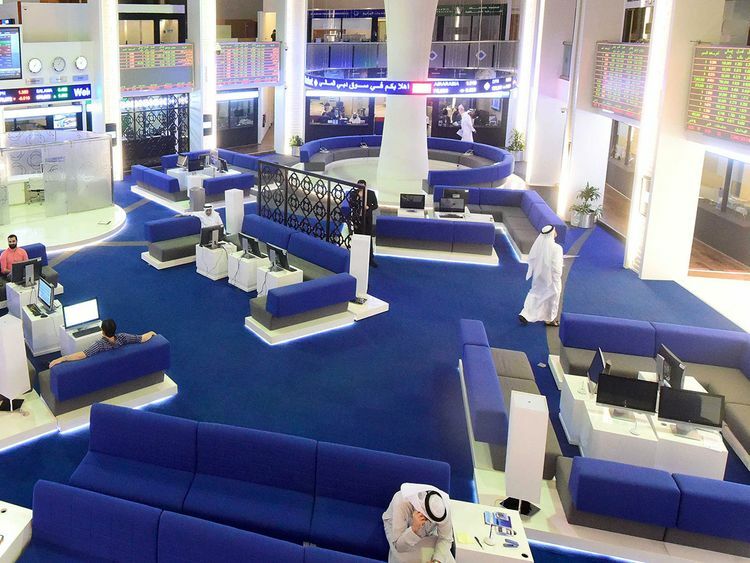 The Muscat MSM 30 index closed 0.34 per cent higher at 4,180.14. The Qatar exchange index ended 0.58 per cent higher at 10,712.39. The Kuwait all-share index was at 5,493.20, up 0.21 per cent, and Bahrain’s was aided by buying in commercial banks. It closed at 1,374.16, up 12 points. The commercial banks contributed to 86 per cent of the total trades. According to bourse data, 136 equity transactions took place with a volume of 8.82 million shares worth 2.524 million dinars.